❶The case and LCD are made from durable plastic materials. ❷Built in sealed button battery can be replaceable but nearly need to charge it. Easy to take Ultra thin and light, fits easily into a purse, scheduler, briefcase or backpack. GoerTek LCD Writing Board is suitable designer, business man, teacher, students etc. It will be your good helper when making note. draft or doing the math. We would like to replace a faulty product or refund your purchase. If you have any problem, please contact with us. We always would like to serve you. GoerTek Writing Board tablet's pressure-sensitive LCD writing surface creates lines of different thickness based on how hard you push - just like paper and pen. 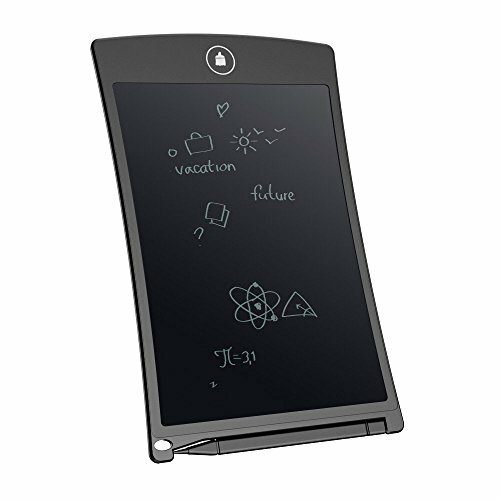 Erase your image or words with only touch of a button-a friendly flash from the liquid crystal display, convenient for kids drawing, making notes lists drafts doing the math and business etc. The case and LCD are made from durable plastic materials, safe for school use and all around the house, office and car. Built in sealed button battery(replaceable), You nearly need to charge it; it can work long time and clean by one button and write over 50000times. The Handwriting Tablet is an ultra 1/5" thin and is easy to take with you in a purse, scheduler, briefcase or backpack. If you have any questions about this product by GoerTek, contact us by completing and submitting the form below. If you are looking for a specif part number, please include it with your message.